Camping Domaine de Ker Ys - Two massive water slides and only 20 metres from the beach. Found upon the shores of the Iroise Sea and only 20 metres from the beach, Domaine de Ker Ys is a holiday camping site not to be missed. Enjoy the beautilful beach which is only a fex meters away or relax at heated camp site pool. 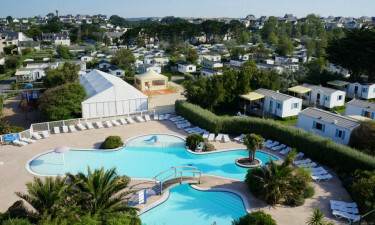 The pool found within this luxury camping resort is heated and it can therefore be enjoyed throughout the year. There are two massive water slides which will keep both children and adults entertained for hours. Also, a whirlpool and an aquatic gym can help visitors keep in shape while relaxing in a sense of utter tranquility. A paddling pool is available for youths and toddlers as well. Why Should I Consider Choosing this Luxury Camping Site? It should never be forgotten that Domaine de Ker Ys is also found within one of the most beautiful natural environments within Europe. Just south of the site is the region of Vendée. 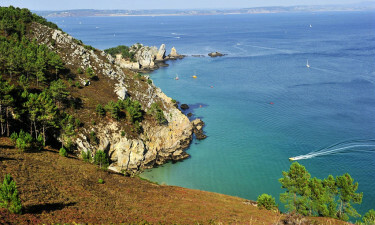 Visiting here will allow travellers to experience the traditional verdant landscapes of France while there are a number of festivals and cultural attractions to enjoy throughout the year. Domaine de Ker Ys provides guests with the ability to play a variety of sports during their stay. Basketball, tennis and volleyball are a few to select. 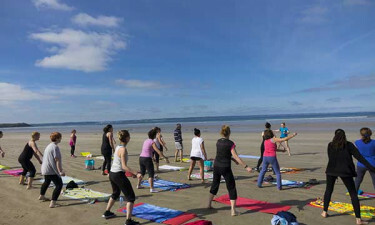 Fitness and stretching courses are offered during the summer months and an aerobics class known as "Aquafun" is a great way to keep lean and trim while fully enjoying all that this holiday camping site has to offer. Smaller shops and a supermarket are located only 8 miles from Domaine de Ker Ys. However, an on-site bread delivery service is available during the peak tourist months of July and August. Likewise, there is a miniature supermarket found within the campsite. Here, shoppers can purchase local produce, fresh fruits and vegetables, snacks and basic camping supplies. Barbecues and baby sets can be rented at this market on a daily basis. Disposable sheets are also supplied. While there are no bars or restaurants located within this luxury camping site, the nearby town of Saint Nic offers a number of wonderful dining experiences. In fact, a bar is found only 0.4 miles from the campsite and visitors can either walk there or take their vehicle. Domaine de Ker Ys is an ideal location for anyone who has been searching for true camping luxury within a stunning natural environment. To learn more in regards to this camping holiday or to ask additional questions, please contact Lux-Camp.